Ginko the traveling doctor has returned, and it feels so good to have him back. 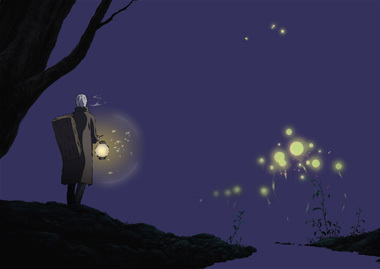 Mushishi follows the melancholic adventures of a spiritual medicine man as he crosses mountainsides and valleys in his quest to help people live peacefully with mushi (invisible creatures that often wander into the physical realm). It's peaceful, often sad, and always beautiful, lush with gorgeous background paintings. 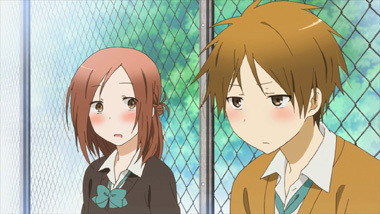 You can catch the first season on Hulu (http://www.hulu.com/mushi-shi), then hop on board with season 2, now streaming on Crunchyroll. Auteur director Masaaki Yuasa returns to the Noitamina programming block with an adaption of Taiyo Matsumoto's (Tekkon Kinkreet) sports manga. However, it's anything but your typical sports anime. It ditches the typical anime trappings and goes for a rough, flexible art style that doesn't hide its imperfections. The ping pong matches are high-stakes games that also tell a story, not just a score. Don't be scared by Ping Pong's art, it has a lot of heart and a stellar tale to tell. You can find it streaming on FUNimation. What happens when you combine BONES studio and mecha? You get a recipe for beautiful animation and crazy cool mecha designs. Sadly, the script isn't as awesome as the art, but there's plenty else to love. You can really tell the creators love giant robot shows and want to put their all into Captain Earth. We're hoping the show heads up to the stars, just like its protangonist. You can stream it now on Crunchyroll. 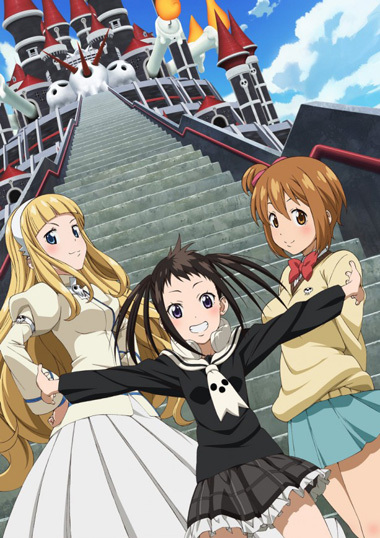 If you wanted to go back to the Soul Eater universe, Soul Eater Not! is your ticket! It follows three new characters, Tsumugi, Meme, and Anya, as they experience school life at the Death Weapon Meister Academy. They get stuck in the NOT class, which is for students that need enough training just to not be a danger to others. It's way more lighthearted than the original series, and offers an enjoyable and adorable side-story. It's available now on Crunchyroll. Looking for a romantic show this season? 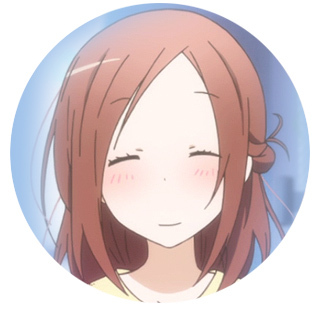 One Week Friends offers a story about Kaori, a girl who loses all memory of her friends every Monday. Despite this obstacle, her classmate Yuki pledges to be -- and become -- her friend every new week. It's just the right amount of comedy, romance, and story to bring you back each week. Brains Base is handling the adaption, and does a great job of rendering the manga in animated form. It's streaming on Crunchyroll. We're cheating a bit here, since Nisekoi started last season, but it's still airing now, so let's remind everyone of SHAFT's latest. This high school romantic comedy keeps going strong with a cute collection of characters and plenty of anime hijinks to keep you busy. It also features plenty of SHAFT-isms, for all of you out there who keep count. 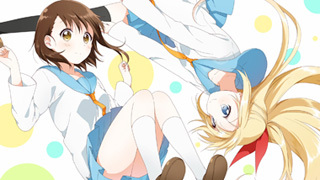 Nisekoi is streaming via (where else?) Crunchyroll. Also enjoyed as a popular manga series, Tonari no Seki-kun tells various stories of the master of killing time, Seki. Each episode is under 10 minutes, so they're easy to catch up on as a little snack between other anime series. 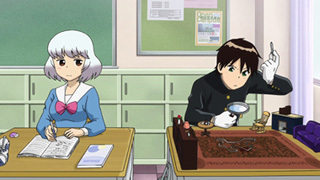 Every new and bizarre way that Seki devises to waste time will baffle both the viewer and his classmate, Yokoi. And you never know who he'll wrap up into his schemes next. It's streaming on Crunchyroll, and is a solid little comedy that'll surprise you. 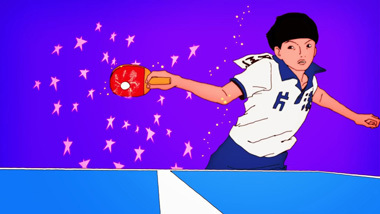 Maybe Ping Pong is too crazy for you, and you want a more traditional sports anime. 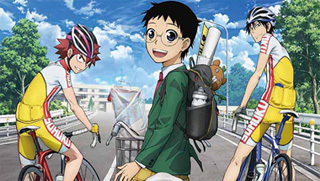 Yowapeda is an ongoing anime series that focuses on Onoda Sakamichi, a timid otaku who joins a competetive cycling club. It features high-speed stakes and a varied cast that might surprise you in their characterization. Plus, if you like biking, especially competetive cycling, there's not many anime out there focusing on it, so it's wonderful that this one is done well. Yowapeda can be caught on Crunchyroll. Here's another sports anime with a ridiculous amount of energy on-screen. Hinata loves volleyball, and when he sees a professional volleyball player who's short like him, he's inspired to play volleyball seriously. From there, it's a wild ride of matches, wins and losses, and finding that his old opponent Tobio has join his high school team. 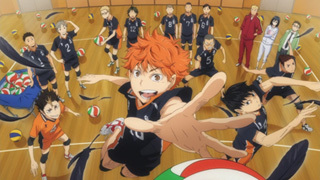 It boasts a better script and pace than most other sports anime, and does a great good depicting volleyball. Watch it on Crunchyroll! How do you even begin to describe JoJo's Bizarre Adventure? The whole thing is an insane experience. 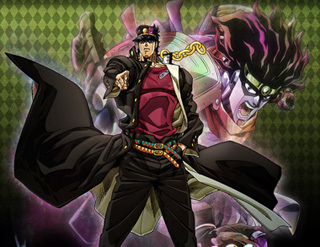 It generally follows the adventures of the Joestar family, but there's also vampires, a stone mask, and a crazy cast of characters that defy categorization. 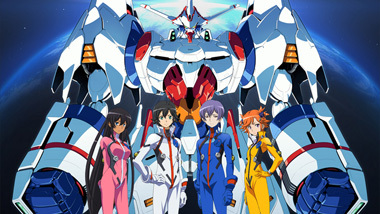 The entire first season is available on Crunchyroll, along with the second season, which is airing now. If you want to be part of the phenomemon, now's the time to jump in.